As the world’s rapidly growing population places increasing stress on global water resources, companies and investors are paying closer attention to water use and water risk management. To help understand and manage exposure to geographic water risks, the World Resources Institute (WRI) and its partners are working with Blue Raster to launch the Aqueduct Water Risk Atlas. Coca-Cola donated maps and data developed to help in understanding and managing exposure to water risks in facilities globally. Through Aqueduct this information has been made accessible to the public in an interactive, easy-to-use platform, providing a comprehensive and credible metric for measuring geographic water risks. The Aqueduct Atlas can create high resolution maps of water risks tailored to your unique risk exposure profile. This interactive application, built using ArcGIS Server, helps companies to quantify and map water risks on a local scale and project future water use and availability. The current mapviewer includes the Yellow River basin in China. In the future, the Water Risk Atlas will analyze risk for a wide range of sectors and river basins including the Murray-Darling, Orange-Senqu, and Colorado River basins. Using the Water Risk Atlas, users can generate detailed, multi-variable maps by adjusting the weight and priority of various factors, including risks related to water scarcity, deteriorating quality, increasing prices, poor water governance, or increasing competition for water resources. The Atlas can be used to model what-if scenarios, identify risks and opportunities , and share water risk information. 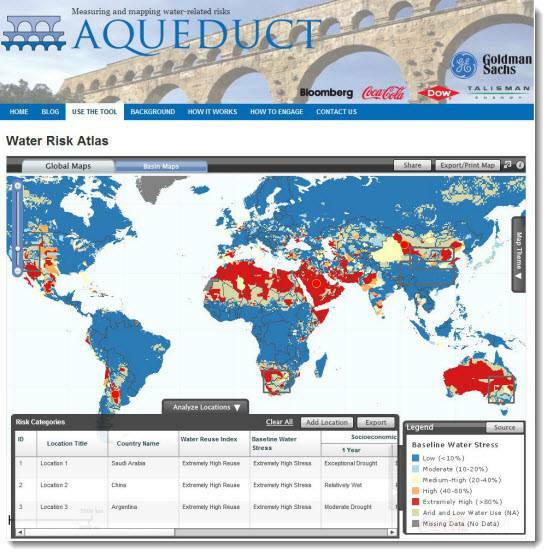 To learn more, visit the water risk mapping platform at http://www.wri.org/our-work/project/aqueduct.